More planners are taking a look at attracting businesses and jobs  not retail  to anchor housing around transit centers. It is widely established that concentrating growth near transit is a key strategy for sustainable urban development. Historically, planning for transit station areas has focused on housing rather than employment  when most people think of transit-oriented development, they picture dwellings above street-level retail. Planning for employment around transit also has the potential to stimulate the creation of innovation districts that capitalize on the co-location of intellectual capital and production resources. High-quality transit access is an increasingly important ingredient for attracting the essential entrepreneurial talent. 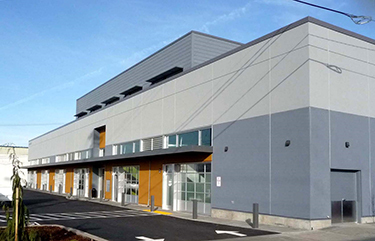 The newly constructed Pitman Building in Portland’s Central Eastside combines commercial kitchens with office space above.